Our workshops are the perfect meeting point for preparing the contents for a noTours soundwalk. Local people bring us to the actual sonorous situation of a place while giving us the necessary clues for finding soundmarks and important sounds. In our workshops we start presenting the project noTours in the context of our experience (now for 5 years) in Escoitar.org. 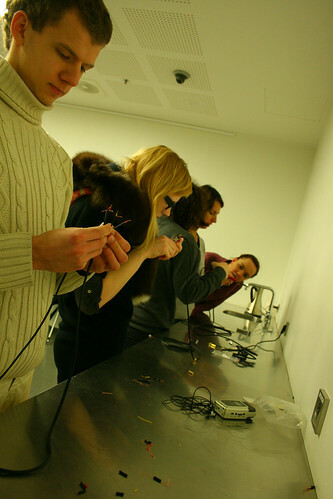 During 3 or 4 days we introduce our students to the use of microphones and recording devices, even building their own binaural and contact mikes. And we donÂ´t forget the theoritical aspects lecturing about the soundwalks format and introducing what are called called aural studies. The final objective of the workshop is composing a noTours soundwalk with the students, while they understand the practical and phenomenological issues and concepts of our field. After introducing our project we went straight to the point of testing the experience of noTours, going out for walking although the weather conditions were really against us. We discussed a lot about the soundscape of Tallinn. Their soundmarks and remarkable noises. In particular descriptions of sounds of trams, sirens of boats, people talking loud, parties, etc. That together with silent landscapes, birds, the sound of wind and coast. In particular, we talked a lot about the importance of traditional choirs in Estonia. It looked to be a powerful way of conducting their national identity. The second day we introduced them to the particularities of microphones and devices for recording. 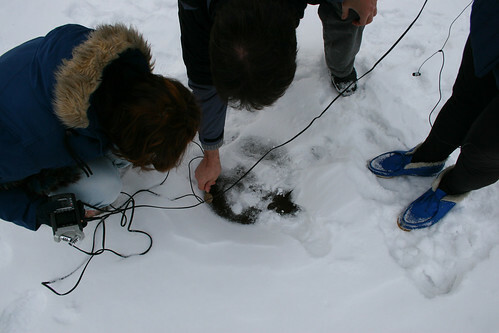 They even constructed their own binaural and contact microphones used for taking the sound of footprints on the snow. As it is so unexpensive (5â‚¬ each) everyone could solder his/her own and get one. This was in particular something that was good appreciated by the students. For recording we compared our equipment (Zoom H4n, Foxtex, AT Figure 8 mikes and soundman binaural) with the cheap microphones soldered in the workshop. Students were happy discovering that their microphones were not so bad comparing with professional ones (in particular comparing the price). Si they started to record sounds in the gardens of Kadriorg, where KUMU is located. There was around a meter of snow in the ground. Sound was really dry because of the absortion of snow. But they took good recordings of footsteps, birds, children playing, etc. They understood the issues of recording (wind, expectations of sounds, inmersion in sound using headphones, etc). Finally they explained their ideas for personal noTours. For example a fragmented soundwalk simulating taking trams in the garden. Trams that are bringing you to invisible stations, connecting with other stations that bring you to other unexpected places. A really cool idea. The next day they were testing the noTours again, editing their soundwalks and continuing with their projects. It was nice to test our editor with more students. We discovered possible uses and issues of the interface that we never found. So students became beta testers and collaborators of the development of our project. They also had to work a little editing their recorded sounds. They understood working with dynamic ranges, adjusting the amplitude, removing noises, using plugins, etc. In resume, they learnt sound edition in a couple of hours. What we found really interesting of this workshop and all we are doing is that students really get the idea of what is listening in an extended way. Connecting sound and place, and time. Secondly, the interface for the contents is really direct: walking. The idea of interface dissapearing. Making it invisible. Making the user behaviours conduct the art work. There are no screen to control. No faders or knobs. Just people movements. They can easy project their ideas, emotions into the project. There is no need for technical skills.It is more a matter of having the enough sensibility for listening and choosing sounds. And this is what we look forward during the workshops.